Medicare Supplement plans in Missouri are just like the other Medigap policies. Since standardizing coverage, a Plan G in Missouri has the same benefits as a Plan G in Kentucky. Medigap plans offer beneficiaries national coverage; so, any doctor that accepts Medicare will accept the plan. Also, Medicare Supplements don’t require a referral; so, specialists are easy to find and make an appointment. Whether it’s Part A hospitalization coverage or Part B outpatient services, Original Medicare covers at only 80%. 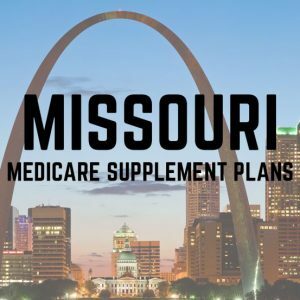 Missouri Supplement Plans can help with these expenses. Without Medigap coverage; the deductibles, copayments, and coinsurances could be a burden. Let’s say Joseph has Medicare alongside Prescription Drug Plan (PDP) coverage. Joseph has a stroke and takes an ambulance to the hospital for inpatient treatment. The Part B deductible must be paid first for the ambulance; $185 deductible doesn’t cover the cost of an ambulance, Joseph must pay 20% of the remaining balance. Then, Joseph is responsible for the Part A deductible, which costs $1,364 per benefit period. The hospital stay is going to cost WAY more than the Part A deductible. So, Joseph needs to pay 20% of the remaining hospital bill! If he’s in the hospital for 5 days because of his stroke, the cost could be substantial enough to wipe out a good chunk of savings. Joseph has Medigap Plan G; other than the monthly premium, the Part B deductible will be his only out of the pocket expense. Supplement Plan G could save Joseph money in the long run by covering hefty medical bills. Once a beneficiary is 65 and has a Part B effective date, pre-enrollment into a supplement is possible. Then, the supplement will have the same effective date as Part B. Beneficiaries can schedule the Part D coverage to begin at the same time as well. Turning 65 entitles you to Guarantee Issue (GI) right during the Medigap Open Enrollment Period (OEP). GI rights prevent insurance companies from charging more or denying your application based on health. This means you get the best premium on the best policy and no underwriting. Beneficiaries can enroll in Medigap coverage any time; there isn’t an Annual Enrollment Period (AEP) with Medigap, enrollment is whenever. Although, outside of OEP beneficiaries will likely go through underwriting and pay a higher premium. Federal law doesn’t require insurance carriers to offer Medicare Supplement plans; however, the state laws require companies to offer at least one policy to disabled beneficiaries. The premiums tend to be higher for beneficiaries under 65; although, state laws require insurance companies to charge ALL disabled beneficiaries the same premium. Those under 65 could benefit from MA coverage. Medicare Advantage (MA) plans are Medicare replacement policies. Instead of Medicare paying claims, the insurance company will be in charge of your coverage guidelines. These policies tend to have much lower premiums than other coverage options; however, the out of pocket expenses can be overwhelming. There are copayments, deductibles and coinsurance requirements. The coverage must be at least as good as Medicare. Now, Medicare doesn’t have any Maximum Out Of Pocket (MOOP) whereas MA plans protect you with this benefit. A MOOP is an amount that a beneficiary can’t spend more than out of their own pocket. So, if Joseph has a MOOP of $7,000 then the most he can pay in a calendar year on his Medical expenses is $7,000. After Joseph spends that amount, the plan will pay services at 100%. So, MA plans can be good for people that can’t qualify for or afford Medigap. Neither Medicare Supplement Plans or Traditional Medicare offer prescription drug coverage. By purchasing a Missouri Medicare Part D Plan it ensures coverage. If you don’t enroll in a medication policy you could incur a Part D penalty. Depending on how long you go without drug coverage will determine the penalty. Medicare Part D costs between $15-$120 a month depending on the policy you select. Beneficiaries with no medications or certain generic drugs could benefit from the $15 monthly policy. However, if Joseph has the $15 drug coverage and pays $100 in copayments every month that could be the wrong coverage for him. Especially if the $40 plan covers those medications for $50 in monthly copayments. Sometimes the lower premium costs more in the long run. Working with an agent can make identifying the best policy easier. The Medicare Savings Program assists beneficiaries with a low income. Those with a limited income could benefit from Extra Help paying for Medicare Part D expenses. Both are good options when it comes to needing extra financial assistance as most seniors are on a fixed income. You can visit Centers for Medicare and Medicaid or your state’s individual health insurance assistance program available on the SHIP Center. All Medicare beneficiaries should subscribe to the CMS Newsroom for weekly information on Medicare topics. The individual insurance carriers across the country each have 10 different Supplement Plans. Regardless of which state you live in the plan benefits are the same with each of the individual carriers. The premium cost is the only thing that will vary. Of the 10 Medicare Supplement Plans, the most popular of the 3 letter plans are Plans F, G, and N.
Plan F covers all the gaps in Medicare. Plan G covers everything except the annual Part B deductible. Then, Medigap Plan N doesn’t cover the Part B deductible or Part B excess charges. There are also copayments with Plan N; $20 for the doctor and $50 for an ER visit without hospital admission. The best time to sign up for Missouri Medicare Supplement Plans is during the OEP. Outside the OEP, insurance carriers can charge you more or deny coverage because of previous health issues. Although, every year Medigap beneficiaries can change from one policy to another policy with the same coverage without underwriting. The Anniversary Rule allows beneficiaries to switch policies within a 60 day period of the policy anniversary. During this time a policy change can be done without answering medical questions. This will allow you to compare premiums and shop plans yearly. Plan changes are simple and can be done over the phone. Keeping up with policy comparison can save you money every year. Most of the Medigap policies in Missouri increase annually as age increases. There are some companies that use issue age rating; in most cases, issue age rating can save you more money over time. Level of coverage can impact costs; Plan F has more coverage, it’ll cost more each month than Plan N. Although, a healthy person with Plan N could save money annually if they had no serious medical visits during the year. Traditional Medicare only provides 80% coverage, this leaves beneficiaries responsible for deductibles, and coinsurances. By enrolling in a Medicare Supplement Plan, the 20% leftover will be taken care of by the plan. Depending on the policy you select, you could have no out of pocket expenses. You can compare rates online or call the number above to speak with one of our brokers that specialize in Medicare consultations. Save yourself time and money; let an expert walk you through plan discovery and the enrollment process.